My mom makes the best dua chua (pickled mustard green), I swear i'm not bias! I have eaten others and it never compares to my mom. It always lack one of the following; texture, color, or taste. Good dua chua must come out crunchy, if there is no crunch when you bite into it something went wrong during the pickling process. The color should be yellowish green, like an olive green. Finally it should taste sour and not too bitter. She knows I love her dua chua, so every time I visit she has a tub for me to take home. 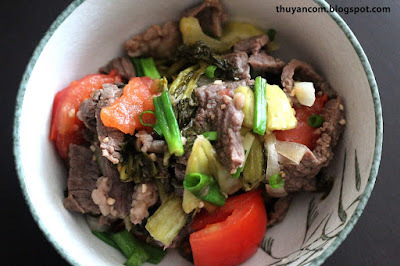 There are a lot of different ways to use dua chua in Vietnamese cooking but my favorite is to sauteed it with beef. 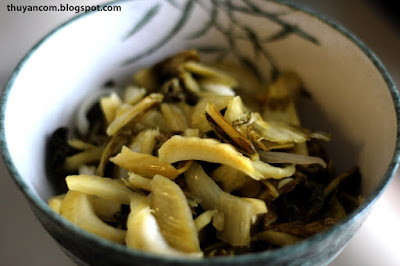 A while ago one of my reader asked me to post a recipe on canh dua chua (pickled mustard green soup). I will get to that recipe the next time I have access to my mom's dua chua. I have to say there's something very addicting about dua chua. The dua chua give a sourness to your dish that is very pleasing to our taste buds. The liquid that is produce from the pickled mustard green and beef marry together and become this wonderful sauce. I can seriously just eat the sauce alone with white rice and you can still taste the beef and pickled mustard green. 3. Once the pan is hot enough add the beef and stir. You don't have to cook it all the way through but enough to brown the outside. my mom used to make this dish for me all the time. I used to totally stuffed myself with this dish it's one of my favorite comfort food. I love your blog! thanks for the recipe, just found your blog and EXCITED about it as 2013 is my year to learn to cook VN food :-). All the recipes from VN have MSG or soup powder as the seasoning - yuck. Will try tonight, thanks again! Cooking is a great hobby to get into, good luck and enjoy your time in the kitchen! MSG is not completely bad if you use it in small proportion. My mom still uses MSG, but she's transitioning into using mushroom seasoning more.